This article describes about a painting museum in memory of Le Mayeur’s work. 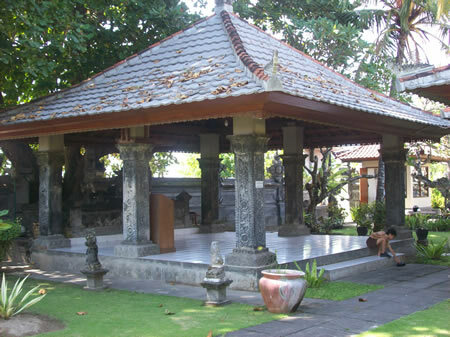 The museum is located in Sanur Beach Bali near the Grand Bali Beach Hotel. It was built on August 28, 1957 with balinese style architecture. A. J. Le Mayeur De Merpres was born on February 9, 1990 in Bruxelles, Belgium. He arrived in Bali in year 1932 and died in piece on May 31, 1958 in Bruxelles, Belgium. Meanwhile, his wife, Ni Nyoman Pollok, was born on March 3, 1917 in Kelandis Village, and died in piece on July 21, 1985 in Kelandis Village, Denpasar, Bali, Indonesia. At the end of Jalan Hang Tuang in Sanur beach, there is a walking track to the Le Mayeur Museum. The entry ticket price is Rp 4000 for adult and Rp 2000 for child. The museum is managed by the Provincial Government of Bali. There are several buildings in Le Mayeur museum area such as Bale Bengong (Open Building), The Bali Night Cafe, Exhibition Hall, Pengijeng (Balinese Hindu Shrine) , Shrine for The Ocean God, and Exhibition Room. 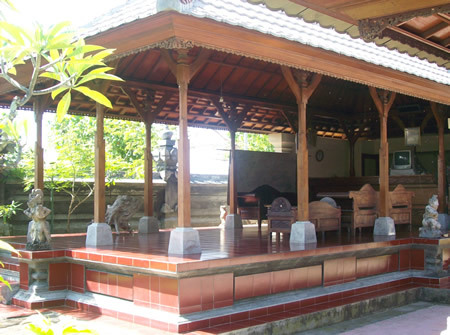 The Bale Bengong (Open Building) at Le Mayeur Museum is used for a relaxation while enjoying the scenery of Sanur Beach. Le Mayeur himself often got inspirations at this place which he then poured onto canvas using his wife, Ni Nyoman Pollok as model. Ni Nyoman Pollok built a cafe named The Bali Night Cafe. This is an open building erected by Ni Nyoman Pollok in 1970 to accommodate requests from the visitors who wanted to meet Ni Nyoman Pollok while having dinner together. This effort was successful at the beginning, but later on due to emergence of some competitors that cafe was then closed. The Provincial Government of Bali has now erected a similar open building at the ex-location of the cafe for the ticket and information counter and a place for relaxation as well at Le Mayeur Museum. There is also an art shop beside the museum managed by Ni Nyoman Pollok’s family. The art shop is selling postcards of Le Mayeur’s painting. Come to Le Mayeur Museum and enjoy the paintings. Le Mayeur Museum is a nice place to visit in Sanur Beach.